U.S. Atlantic Continental Shelf, showing location of study area and approximate locations of survey areas (letters) with marine sand deposits either used as data sources or mentioned in text (from figure 1). Cape- and ridge-associated marine sand deposits, which accumulate on storm-dominated continental shelves that are undergoing Holocene marine transgression, are particularly notable in a segment of the U.S. Atlantic Continental Shelf that extends southward from the east tip of Long Island, N.Y., and eastward from Cape May at the south end of the New Jersey shoreline. These sand deposits commonly contain sand suitable for shore protection in the form of beach nourishment. Increasing demand for marine sand raises questions about both short- and long-term potential supply and the sustainability of beach nourishment with the prospects of accelerating sea-level rise and increasing storm activity. To address these important issues, quantitative assessments of the volume of marine sand resources are needed. Currently, the U.S. Geological Survey is undertaking these assessments through its national Marine Aggregates and Resources Program (URL http://woodshole.er.usgs.gov/project-pages/aggregates/). In this chapter, we present a hypothetical example of a quantitative assessment of cape-and ridge-associated marine sand deposits in the study area, using proven tools of mineral-resource assessment. Applying these tools requires new models that summarize essential data on the quantity and quality of these deposits. Two representative types of model are descriptive models, which consist of a narrative that allows for a consistent recognition of cape-and ridge-associated marine sand deposits, and quantitative models, which consist of empirical statistical distributions that describe significant deposit characteristics, such as volume and grain-size distribution. Variables of the marine sand deposits considered for quantitative modeling in this study include area, thickness, mean grain size, grain sorting, volume, proportion of sand-dominated facies, and spatial density, of which spatial density is particularly helpful in estimating the number of undiscovered deposits within an assessment area. 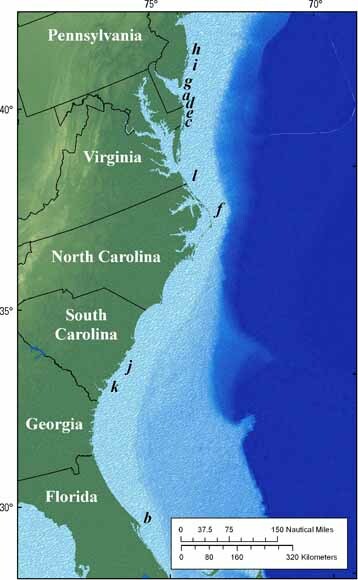 A Monte Carlo simulation that combines the volume of sand-dominated-facies models with estimates of the hypothetical probable number of undiscovered deposits provides a probabilistic approach to estimating marine sand resources within parts of the U.S. Atlantic Continental Shelf and other comparable marine shelves worldwide. Download this 28-page report, (b2209m.pdf; 1.8 MB). Go to other chapters in USGS Bulletin 2209: Bliss, J.D., Moyle, P.R., and Long, K.R., eds., 2002, Contributions to industrial-minerals research: U.S. Geological Survey Bulletin 2209.